Australia was once home to a giant prehistoric Ice Age marsupial related to wombats and koalas, and that followed an annual seasonal migration. The three-tonne beast, up to 1.8 metres (6 ft) tall and 3.5 metres (11.5 ft) long, was the only known marsupial to follow a migration pattern, according to our research published in the journal Proceedings of the Royal Society of London B. For many years, palaeontologists have marvelled at the fossil deposits of southeast Queensland's Darling Downs, describing it as a "vast graveyard" of the enormous herbivorous and carnivorous animals of the Pleistocene (from about 1.6 million to 10,000 years ago). These giant, now extinct animals are commonly dubbed the megafauna and comprised a suite of oversized marsupials, reptiles and birds. Megalania (Varanus priscus), the biggest venomous lizard ever to exist, the Marsupial "Lion" (Thylacoleo carnifex), the largest known pouched predator, and the ruler of the Pleistocene, the 3,000kg wombat-like Diprotodon (Diprotodon optatum), famous for being the bulkiest marsupial ever to walk the planet. But what was life like on the Darling Downs during the Ice Age? Our new study focused on reconstructing the palaeobiology and palaeoecology of Diprotodon in an effort to reveal the secrets of "Australia's Serengeti". Diprotodon is one of the first Australian animals described on the basis of fossils, but very little is actually known about it. Its fossil record tells us that it was the most widespread species of megafauna and also one of the last surviving. The old saying "you are what you eat" is absolutely true, for the chemical signature of the foods that an organism eats becomes fixed into its teeth when they form. But it's also true that "you are where you ate", especially if you are a plant eater. The geochemistry of the soils where plants grow also becomes incorporated into a herbivore's teeth. If that particular geochemical signal varies within a given tooth, it would imply that the individual fed across different geological regions when alive. Like elephant tusks, Diprotodon's front incisors never stopped growing throughout its life. Thus, our sampling revealed not only seasonal changes in food and water intake of the Diprotodon, but also the various geological provinces where the individual once travelled. Our data clearly show that Diprotodon was a seasonal migrant. It tracked its preferred food source year after year across vast geological regions of the Darling Downs. It would move roughly north to south and back again, up to 200km (125 miles) per year in massive round-trip journeys, just like many of East Africa's mammals do today. And like those East African cousins, Diprotodon moved in herds or mobs. To date, no other marsupial living or extinct is known to undertake such journeys. This is all the more remarkable considering that Diprotodon's closest relatives, the metatherians (a mammal group that includes all living marsupials but not placental or egg-laying mammals), have been around for more than 160 million years. Our data suggest that such migration is an ecological phenomenon that has been extinct in Australia since the Pleistocene. Not only does this have implications for understanding what happened to the megafauna, but there may be many other lessons we can learn from this finding. The potential collapse of modern ecosystems containing migrating organisms worries ecologists and conservationists the world over, particularly in terms of knock-on effects. For instance, relatively large-bodied herbivores such as zebra and wildebeest are keystone migrating herbivores of the Serengeti, dramatically influencing and changing environments for other organisms across vast areas. What would happen if these animals went extinct and the migratory corridors of the Serengeti broke down? Would it lead to widespread ecosystem collapse and further species loss? Our new finding suggests that Australia could serve as a natural experiment for understanding what might happen. 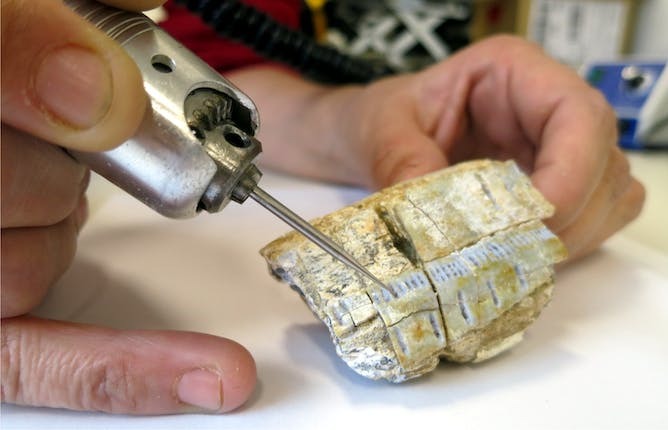 The fossil record provides the before, while the current ecosystem provides the after. But more research into this area is critically needed. The fossil record between the Ice Age and today remains incredibly patchy. We just don't know the consequences of the collapse of these prehistoric ecosystems. Filling in the gaps, further understanding which other Australian megafauna were migrants, what happened to them in terms of extinction, and the knock-on effects, will be fundamental in yielding conservation lessons for our planet. Gilbert Price, Lecturer in Palaeontology, The University of Queensland.